Space shuttle Discovery's seven astronauts were welcomed at the Kennedy Space Center today for upcoming emergency training exercises and a countdown dress rehearsal with the launch team. 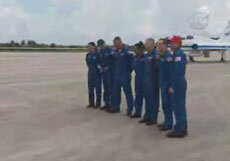 Commander Rick Sturckow, pilot Kevin Ford, mission specialists Jose Hernandez, Danny Olivas, Christer Fuglesang, Pat Forrester and station-bound astronaut Nicole Stott flew from Houston to the Cape aboard several two-seater T-38 jets. "It was a great flight down, had a great look at the rocket sitting on the pad," Ford told reporters at the runway shortly after arrival. Every shuttle crew undergoes the Terminal Countdown Demonstration Test, or TCDT, in the final weeks before a planned launch. 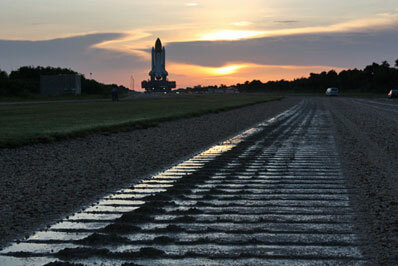 While in Florida, the astronauts will spend time learning how to evacuate pad 39A if an emergency arises, including procedures to operate the slide-wire baskets that would quickly whisk the crew from the launch tower to a bunker west of the pad, and test-drive an armored tank available for the astronauts to escape the area. On Friday, the crew will board Discovery for a full countdown simulation. The astronauts will follow a normal launch morning routine with breakfast, a weather briefing on conditions at the Cape and various abort landing sites, then don their suits and depart crew quarters at about 7:45 a.m. to board the Astrovan that will take them to pad 39A. After arriving shortly past 8 a.m., all seven astronauts will climb inside Discovery and strap into their assigned seats for the final three hours of the mock countdown. Clocks will halt in the final seconds to simulate a shutdown of the three main engines just prior to liftoff around 11 a.m. The crew will egress the shuttle and practice scurrying to the slide-wire baskets.